Richard Pitino losing two Gophers basketball assistants in the last week might appear concerning to some fans, but members of his 2018 recruiting class aren’t in panic mode about the situation. Kimani Young and Ben Johnson, the two longest tenured assistants for Pitino, left to join staffs at UConn and Xavier, respectively. Johnson was Minnesota’s top local recruiter. 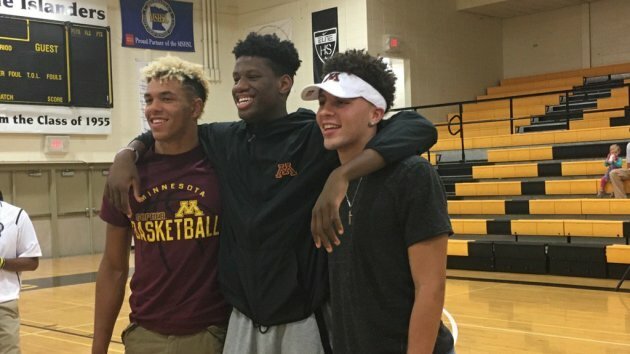 Gopher recruits Daniel Oturu, Gabe Kalscheur and Jarvis Omersa said after hearing of Johnson’s departure Tuesday that they were happy for him. Oturu, who is sitting out of Nike Hoop Summit practices in Portland with a shoulder injury, said he wishes Johnson nothing but the best. Omersa agreed with Oturu’s stance on the assistant coaching departures. The Gophers have three scholarships still to use in the 2018 class, so they didn’t take long to find Young’s replacement with former Wisconsin-Milwaukee head coach Rob Jeter. But Pitino wasn’t expecting another coach to leave a week later. Johnson was announced Tuesday as taking the same position at Xavier. How important will it be for Pitino to consider adding a staff member, like Johnson, that had strong Minnesota ties? Obviously, Pitino will look to hire somebody that is the right fit with Jeter and Ed Conroy, now his longest tenured assistant after joining the Gophers in 2016. Dave Thorson, Colorado State – Thorson is a former Gophers assistant under Clem Haskins, a position which ended up giving him a chance to return to the college game 20 years later. Niko Medved, a former U manager under Haskins, hired Thorson last year to join him at Drake. The longtime championship coach at DeLaSalle then followed Medved to the Rams this spring. Daryl Sharp, Hampton – Sharp has been at Hampton for eight seasons, going to three NCAA tournaments in that span, including in 2015 and 2016. The father of former Gophers walk-on and Hopkins guard Stephon Sharp. His high-major experience includes time as an Iowa State assistant and former director of basketball for Denny Crum at Louisville. Coached AAU and high school ball in Minnesota. Kyle Green, Northern Iowa – Green, a Minneapolis native, is an associate head coach for Ben Jacobson at Northern Iowa. He’s spent 13 seasons on the Panthers coaching staff. A 1992 Hamline graduate, his son, A.J., is a four-star 2018 point guard recruit who signed to play with his father at UNI next season. Richard Hurt, D1 Minnesota – Hurt is co-owner, coach and director of operations for D1 Minnesota, one of the top AAU programs in the country. He’s been an assistant at Rochester John Marshall for eight years. His oldest son, Michael, is a junior-to-be with the Gophers. His youngest son, Matthew, is a top-five recruit in the 2019 class and all-state forward at JM. Gameli Ahelegbe, South Dakota – Ahelegbe has been on South Dakota's staff for four seasons and spent three seasons at North Dakota prior to that. Was on the Coyotes staff when they upset the Gophers at the Barn in 2015-16. Former club director and trainer at 43Hoops AAU program in Minnesota. Played at Minnesota State and briefly in the ABA.